Ready to change your regular smoothie bowl for breakfast? 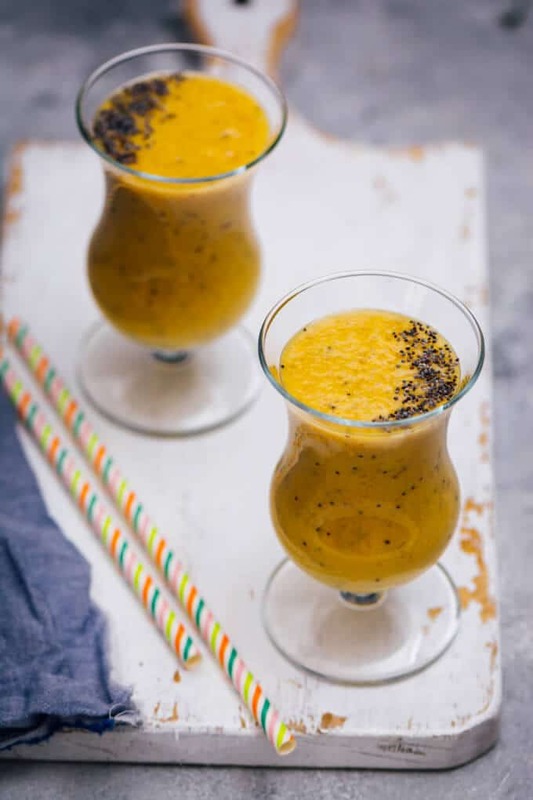 Try this rich and creamy Turmeric Golden Milk Smoothie with poppy seeds for a super healthy start in the morning. This naturally sweetened smoothie is vegan, nutritious, soothing and unbelievably tasty! Ready in 5 minutes with 5 ingredients. 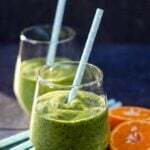 I’m here to share a great smoothie recipe today that has become a favorite of mine recently. Have you ever tried turmeric milk aka golden milk before? 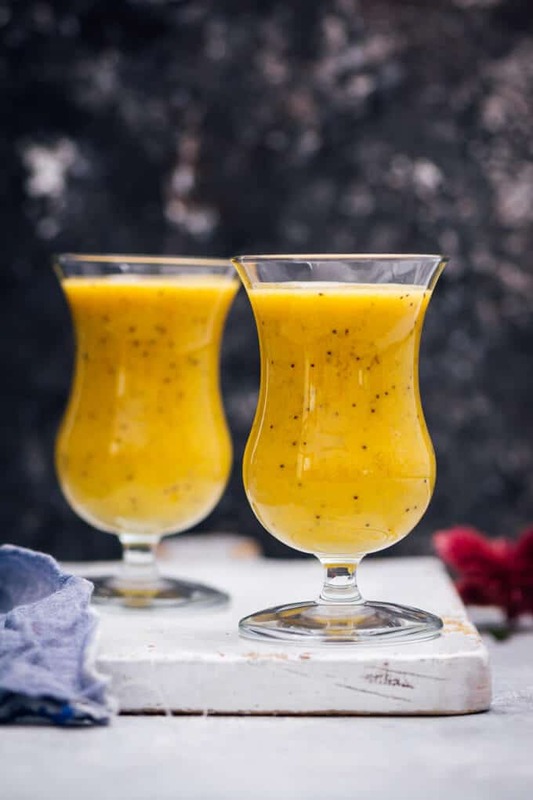 I made a twist on this super healthy drink and ended up with an even healthier recipe: Turmeric Golden Milk Smoothie. This is a vegan smoothie recipe and a great way to include the super food turmeric in your diet. Besides its amazing color, turmeric is known as an anti-inflammatory food and a strong antioxidant just like our Healthy Grapefruit Smoothie. In addition to turmeric, I added some poppy seeds in the smoothie mixture both to give it a nice crunchiness and to increase the amount of nutrients. 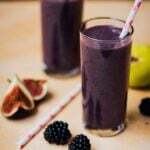 If you are already a smoothie fan in the mornings, you need to give this healthy one a try. Originally used in India for health issues, turmeric golden milk has been so trendy for a few years. It is basically the combination of turmeric powder or fresh turmeric, milk and black pepper. Use your choice of milk, as much turmeric as you like and black pepper, your golden milk is ready. Add in other spices like ginger or cinnamon as well if you like. Don’t worry if you are not a fan of turmeric, it’s not strong thanks to milk. Plus I use banana and maple syrup in this smoothie, so you don’t feel the taste of turmeric that much. We need only 5 minutes and a blender to make this smoothie. Combine banana, coconut milk, turmeric, maple syrup and poppy seeds in a blender. Blend until smooth and serve with extra poppy seeds on the top. Unlike traditional golden milk recipe, I didn’t use black pepper in this smoothie. Other plant-based milk options for this recipe might be almond milk, cashew milk or soy milk. Also, you can substitute flax seeds for poppy seeds or even use both to add even more nutrients in your smoothie. I didn’t use it just because we didn’t have it on hand. Sweetening the smoothie is totally up to you. I add 1 teaspoons maple syrup but you can use agave syrup or raw honey if they are what you have. On the other hand, no sweetener might be needed if the banana you use is sweet enough. Turmeric, which is the star ingredient of golden milk, definitely deserves the name super food because it has several health benefits. For one thing, it improves immune system, so you can decrease the risk of cold or the flu if you have turmeric in the mornings in winter. Can you think of a better option for this than having a smoothie with turmeric? It is known as a remedy for cough too and I wouldn’t leave black pepper out if I needed a relief from cough. In addition, turmeric is a great remedy for problems in digestive system and headache. Also, it is mostly known with its anti-inflammatory effect. It reduces arthritic pain when consumed on a regular base. Another great effect of turmeric is that it can destroy cancer cells and prevent their spread. If you are looking for ways to include turmeric in your diet, you can check out our Turmeric Orange Poppy Seed Dressing, Turmeric Tahini Dressing or Banana Turmeric Chocolate Cake too. Add all ingredients into a blender and pulse until smooth. Serve it immediately in glasses with extra poppy seed topping.